What is the Exponential Utility Function? Where R is the Risk Tolerance. 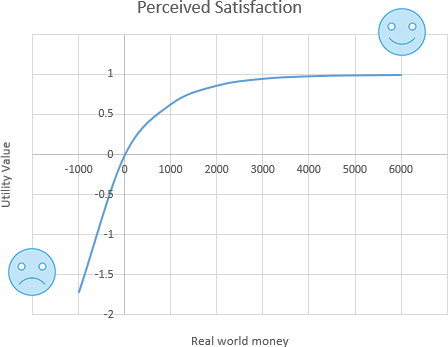 x is the real world value and u(x) is the utility value or perceived value (the value of an outcome in utils). "a" and "b" are essentially scaling parameters. Decision Tree Software can calculate that parameter based on the Minimum and Maximum possible values in the decision context, which is collected from the user. In the above chart, we used the Risk Tolerance value (R) = 1000. The more is the Risk Tolerance, the more straight line the chart becomes. When your risk tolerance is infinite, the above function becomes a straight line equation. That means if you are highly risk averse (means, very low-risk tolerance), then your utility function chart will be steeper, very quickly the satisfaction level will reach to the maximum. The exponential utility function is mainly used to measure the utility of monetary gain where there is a chance of losing money. 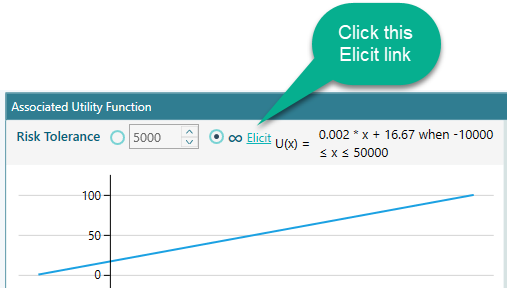 Once you open the objective editor, click the button "Exponential Utility Function". The most important parameter in the Exponential Utility function is the Risk Tolerance. 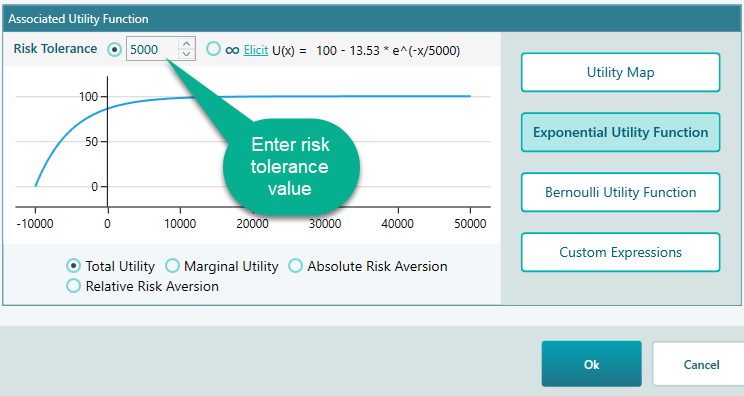 You can directly enter the Risk Tolerance value here, as shown in the following screenshot. If you completely risk neutral, your Risk Tolerance value should be infinity. You can set that by clicking this radio button. It is possible to infer your risk tolerance based on a hypothetical lottery setup, where you can enter a certainty equivalent value for that lottery. Click the "Elicit" link. Once you click that link, you will see the following window. Enter a Certainty Equivalent value using the slider as shown here. You will see a risk tolerance value is calculated. If you click OK, you will see the calculated risk tolerance is passed to the Exponential Utility function editor. There is another way to elicit the Risk Tolerance. It is called "Approximate Risk Tolerance". 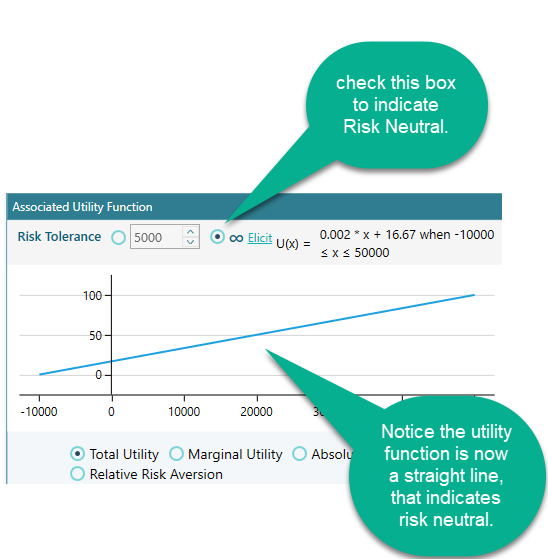 Check the radio button "Approximate Risk Tolerance" and then using the slider, set a Risk Tolerance value as shown below. 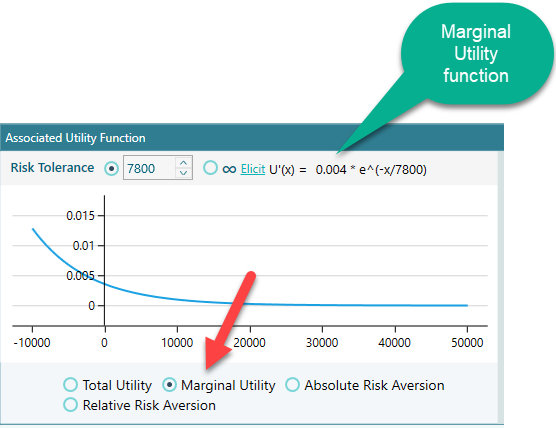 You can see the Marginal Utility function for this utility function by clicking the Marginal Utility radio button. In the same way, you can see the Absolute Risk Tolerance and Relative Risk Tolerance function as well.